At the outset – I would like to warn all you friends that this is me – unleashed – unplugged – uninhibited going berserk just talking to you all about a great human being who lived – loved –sang and breathed divine music and passed away. My jottings as I would like to call them will not have a set pattern but would be reverential expressions loosely strewn at random. He left a world full of humans – following him and his singing as an institution and in time to come has almost become a cult. I am one of those billions of humans who are simply mesmerized with this great singing legend whom I personally consider a singing avatar. I have found that in our dedicated Rafi Sahab website “Mohd Rafi dot com”, the fans / bhakts have written umpteen number of Articles on his songs / styles of singing / class of singing / divinity in rendition centralized to his abilities as a singer. Very few have tried writing on him as only a person and a personality. I for one strongly feel that if tens of thousands of fans start writing on Rafi Sahab – all of them would write something unique which the other would not have expressed – simply because he would not have known that facet of Rafi Sahab. Yes – the more you delve on this subject called “ Rafi Sahab “ the deeper and exciting it gets taking you on a never before traversed journey of ecstasy. As a young boy and in school, some of his songs made me cry, when I did not even know his name and my darling late mother told me that he was a singer by name – Mohammed Rafi. Even now, self having seen sixty two summers, numerous gems rendered by him make me weep profusely like a small child. When I am in front of my pc and weeping – my family knows for sure – Rafi Sahab would be the centrality of my condition. From Swargiya Kundan Lal Saigal Saheb to Swargiya Kishore Kumar Sahab – all our singers of yester years could pull out loads of tears at least in one of their songs. But, Rafi Sahab could do that to you at will. I for one have lost count as to how many of his songs could be listed out in pathos – virah. Every song – Rafi Sahab sings – you can see his soul in it – he has given all that he has in him – into the song – so much so – that the listener – is sucked into a whirlpool of sorrow – experiencing the song in totality as if he / she is the central character. I am purposefully, not quoting examples of his innumerable renditions – as my fellow writers would definitely do that with their views / counter views in detail. Moreover, it must be evident by now that – I do not have the wherewithal as to the songs to be listed. Rafi Sahab’s voice was termed as “true voice” by our erstwhile friend late shri. Swaminathan Iyer. His article under that title is so absorbing and valuable that I consider it as one of the best articles written on this beautiful Rafi Sahab website. Late Iyer sahab, has taken great pains (it would have been like drinking water for him) to write so very analytically in comparison to some of the legends – how Rafi Sahab stood out as someone special and uniquely relevant and way beyond the times. As I am writing – my mind is being stormed by a whirlpool of thoughts about my dear Rafi Sahab, that, the joy within me is goading me to go on expressing with gay abandon and not to bother about my limited vocab. I have always observed Rafi Sahab (while he was singing live and in visual archives), he always sang with a divine smile on his face irrespective of the song being a melody, peppy, romance, patriotic or a sad one. This reminds me of an incident (as reported) in Rafi Sahab’s singing career – which I doubt would have occurred with some other play back singer. He was once approached by a reputed music director to sing a very sad song. Rafi Sahab sang it beautifully as usual and the MD too liked it immensely. The only hitch was the MD kept reminding Rafi Sahab that, it was a sad song and to wipe that smile off his face as he crooned away. Now we all know that – God had created Rafi Sahab with a few in built mannerisms and he was just being his humble simple self. Lo – behold – even after repeated re-takes (just because of Rafi Sahab smiling while singing a sad song) the MD was furious and he simply asked Rafi Sahab to quit and leave. This is one of his numerous examples of his humility and simplicity. There is no end to anecdotes of his benevolence and citing the many examples would require me to fill many pages and it has already been chronicled in various write ups. I have a lot to write but wouldn’t want the fans / bhakts to get bored and abort reading before arriving at the end. When will our politicians as rulers realize that the highest Indian civilian award “Bharat Ratna” will be blessed and be counted in the world only when it gets colored with our Avatar’s name. 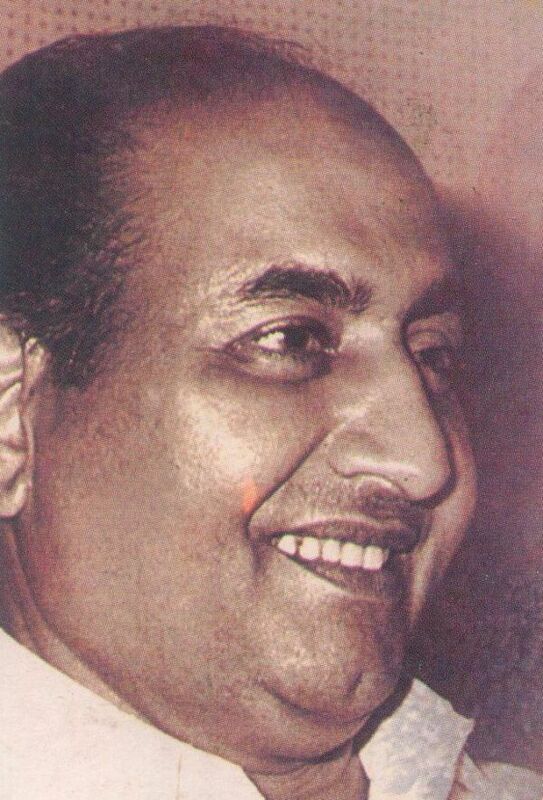 Long live Rafi Sahab – jai ho – jai ho – jai ho Rafi Sahab – tussi vaakai great ho. This entry was posted on Sunday, July 24th, 2011 at 7:34 pm	and is filed under Meri Awaaz Suno. You can follow any responses to this entry through the RSS 2.0 feed. You can leave a response, or trackback from your own site. 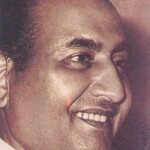 Mohammed Rafi is truly a Saraswati-putra, Bharat Ratna or no Bharat Ratna. Continuing with my Post 15 and post 33 0f Dr. ZK Lodi ji…., I fully agree with Dr. ZK Lodi ji. 1. India is playing cricket against very few countries most of them not even 5% of the size of India in terms of population. 2. India only few times managed to be on top slot but most of the time struggling to even reach the top three slot. 3. Many times, India wins because of the opponent teams not playing well. 4. Bharat Ratna should be given to a sportsman who has served the country beyond his achievements in his respective fields of sport and more for human values, selfless services to mankind and noble cause than anything else otherwise Arjuna award is sufficient for that sport person and Sachin getting this award should is not an issue for me at all if it is on merit. 5. Here is the case of Rafi Saheb who is even posthumously continuing to touch and heal to the infinity the lives of millions of common person like me globally 24X7 with his thousand of songs of all moods and shades suiting that particular mood of ours and elevates our mood and rejuvenate and revitalizes vital and positive energy in us which no modern medicine or cricket can do to us. 6. Here is the person, whose soul is so noble and immortal, voice so divine and lively, personality so gentle and kind, he deserves heavenly “Swarga Ratna” award from almighty gods and goddess nominated by non other than the Goddess Saraswati herself and not the earthy Bharat Ratna award from the bankrupt, corrupt and insensitive successive Indian Governments of last so many decades. I am sure he must have been awarded this Swarga Ratna long back (may be 31 years back at the time of the reception party in the heaven in honour of him) and we have no clue or access to this important heavenly development even after 31 years. So let all of us call him Swarga Ratna from now onward and this can be our true and humble shradhanjali to our beloved Swarga Ratna Shree Rafi Saheb on his 31st death anniversary and symbolic of our emotions and endless love for him. Thank you very much for your kind words and your crusade to get Rafi the Bharat ratna. I understand how you feel. I just want to add to my previous comments that Suchitra Sen, the famous Bengali actress, basically rejected the Dadasaheb Phalke Award, the highest award in cinema, when she refused to travel to New Delhi and receive it personally from the President of India. However, I support you wholeheartedly in your noble effort and wish you success. i am honored by this rare ” acception to the rule ” of your persona. a loaded comment from you and the soothing feeling it gives me for the ” lessons ” within it is immense. yes – i agree with you in toto SIR, trinkets wont matter to such a great name called ” rafi sahab “. its just that – i feel deeply hurt that the world – which enjoys everything that rafi sahab gave us – lapping it up – and then – being so rude and harsh – as to – being stupidly stubborn and naive – in not – ensuring that the highest indian civilian award gets its real due once the avataar \’s name ” adorns ” it. professor sahab – for me – its a crusade in my mind – rafi sahab and bharat ratna are just one – cannot be seperated. saaraa vishva kaa ratna hai – hamarqaa rafi sahab. your comment – are great words of encouragement from a ” guru ” to a shishyaa. Thank you for this touching piece. You are a great admirer of Rafi and your passionate appeal to the politicians to present him the Bharat ratna is laudable. I hope that they will ultimately listen to you. Even if they don’t, Saraswati’s son will not lose anything. He is already an avatar, as you say. An avatar does not need awards from humans. Many worthy artists and thinkers rejected awards. Sinclair Lewis, the American novelist, rejected the Pulitzer Prize; and Jean-Paul Sartre, the French philosopher, rejected even the Nobel Prize. Such awards are like trinkets for decoration. The very existence of this website and the numerous articles here on Rafi’s excellence as an artist and his generosity as a human being prove that Rafi has already received the greatest award: the undying love of music lovers. There is no award bigger than that. Bharat ratna will not make him dearer to us. He will be loved by music lovers the way they have loved him all these years whether he gets it or not. Your love for Rafi that comes from the bottom of your heart is a million times better than any trinket some government may give him. You have already given him his greatest award. Thank you for that. In India it is not at all possible to get justice in distributing awards and honors to the right and deserving personalities.otherwise No Rafi ,sahir,gurudatt,balraj sahni,jayant,k asif mehboob khan would be left?. I appreciate sachin as a greatest cricketer but personally i opine that let other countries award him but in india cricket has not done well to Indians,as i see it causes thousands of men-days are lost during matches,and in short it is affecting our productivity and progress.If it would be a good game than Americans, Chinese, Russians,French, Germans,Japanese would definitely play this game.hence Rafi is a right candidate to award Bharat Ratna.If we award Rafi the beauty and credibility of this award will be well justfied. Respected sir, Many thanks to you for this wonderful write uo on our FARISHTA,,, He is a singing god & institution itself of music.One who says i don’t like rafi sahab he don’t know ABCD of music. Thanks again to you sir for this lovely article. Nice Article Sir. Keep It Up . I am also Rafisaab’s Fan. I am Just 26 years old but I love to listen the songs of the Legend Immortal Padmashree Mohd.Rafisaab and also like to read the articles on him. I thank you for sharing the article with us. Keep It Up. My Best Wishes Are With You. God Bless You. Many of us never saw Pele playing football but still they say he was the best in football history,in India there are many people love Brazil football team but they never saw brazil playing or they don’t know about football,that all because what they read in media,also as bollywood news which is 90% is not true! !every day we get some thing new good thing about mohd rafi at last interveiw by Shaan ji the singer we was thinking he is kishore da fan because mostly he sang kishore da songs but he said I sing kishore da songs because it was easy for me got compare mohd rafi songs, when there was mohd rafi they put five plus songs in a film but today only less than 5 and the only song became hit which song with bad words or showing the body that so sham…..
mai aapkaa peeth thap thapaa rahaa hoon – iss post key dwaaraa. rafi bhakt ho aap – dhanya hogaye. Let us start a SMS campaogn for the honour to be given to Safi saheb because Rafi was and is the best of all we have and his contribution to Indian music is so great not equalled by any other singer. Hum unki Waaz sunkar bade hue shatad hi koi Hindustani hoga jiske unper unke gaano ka asar nahi hua hoga. Deshbhakti ke geet kaise bhula sakte hai woh gaane jo Ab kewal 26 Jan aur 15 August ko sunne ko milte hai. Bhajans aise ki annkhen band karke unka maza lene ko jee chahe . Romantic songs, Sad songs , Masti ke gaane, Aur Gazals & qwaalis or claasicals hai koi aur gayak jisne yeh sab gaane itni simpy gaayein bina kisis effort ke (effortless singer he was) < Bus itna hi kahunga woh the Khuda ki awaz . Bharat Ratna unhe dena hi hoga aao Is awaz ko bulnad karein is 31 st july ko SMS Bheje pls let us send it in great numbers so that it becomes a big bews and may reach to govt also. I agree with you achal that the bharat ratna does not deseve rafi saab. A great write up really from the heart sailor ji. its truly dil se…..
hamara rafi saheb ne to millions ko ghayal kiya hai …… har type ke geet gaakar ke. whether its a live concert or at the recording theatres – mohammad rafi saaheb was unmatchable. hundreds of his fans will gather at mumbai’s big mosque on july 31 a sunday which is at juhu santacruz to offer flowers and tributes to rafi saaheb on his 31st anniversary (Punyatithi). No one composer has ever told the titan mohd rafi to ‘quit’ the recording and go home as per my information. the incident is just a ‘hearsay’ as the song, film, composers name – is not mentioned anywhere. i think mohd rafi lovers must rely on facts and re-check them before publishing them. but, as usual u are a die-hard fan and small inaccuracies may be overlooked as the article itself is a declaration of your love for the titan and emperor of singing – mohammad rafi saheb. I can appreciate what made you write such a wonderful article on the 31st Anniversary of the Greatest playback singers of all time, our beloved Rafi Saheb. Very rightly said that if every one writes about Rafi saheb he woulld write something new and unique. You can go back to March 2010 Archive of this website to read what I wrote about Rafi saheb in the same state of mind as yours. The difference perhaps is that I was so near and close to him and yet far away in a very different and unique way. I missed meeting him in UK, Kuwait, Canada and Pakistan by a few miles only on each occasion. Those near misses have made me so closest to him that I wonder!!!!! This is the second time I’m posting my comments on your Dil Se wallah article. The first time around the moderator only can say what happened! Your write up is that of a sincere and great Bhakti. I only differ with you on one count- the Bharat Ratna does not deseve Rafi Saab. Nice article, straight from the heart. How true, whenever we listen to certain songs (majority of them Rafi Saabs), we have tears in our eyes, perhaps because of the beautifully written lyrics on life or patritism, etc. But I have noticed that certain romantic songs of Rafi Saab also bring tears. I always feel that we get tears some what due to the divine experince of a beauty, the beauty may be due to a heartwarming thing or your children’s performance or when Rafi Saab sings. How many times, I have wondered, can an ordinary person sing so well? Certainly he had a divine voice. Passion… passion…. passion………… that was ur writeup. Need I say more. HAK WALIJAH SAHAB, NAWATHE SAHAB, SANTOSH SAHAB, UTTHARA CHELLAI, NAGESHBHAI, VASU-KAY-JEEE, NRPBHAI. Those were grreat words coming from humans who own their own could write in a manner enough to move mountains. rafi sahab, always inspires me and motivates immensely and it simply ” numbs ” my entire thought process and compells me to write on him ( can you believe ) even if i am blank as to its contents.such is the persona of rafi sahab, a perfect human and a role model of the masses. if somebody says nice words about a write up on rafi sahab, the credit goes in toto to the maestro himself. a singing avataar, showed the way to all humans who heard his divine voice. for me its sad to note and commit – to have come across some people who sing paens in the name of rafi sahab, but, failed to pick even a small leaf out of his book. NRPBHAI – aapkaa andaazey bayaan – mujhey bacchhaa banadiyaa – mai phoot phoot kar rodiyaa – dil kee bhadaath nikal gayee – aur mujhey ehsaas huaa – kee aap jaisey mahaa purush ( merey acchhey dost ) bhee duniyaa mein hain jokee ” insaan koh ek acchhaa raastaa dikhaatey hain. haanjee main likhoonga zaroor lekin sirf rafi sahab key shakshiyat par. UTTHARA CHELLAI – such eloquent praise coming from a senior personality in the journalistic world – makes me sit upright and take note – yaar mujhsey koi gustaaqi toh nahee hogayee. madame i am honoured – your words have floored me. tehey dilsey shukriyaa. Nageshbhai – you have always been appreciative with regard to my writing and what inspires me more is when i read your indepth magical commentaries on anyhting you lay your hands on. i am blessed to have some great naturally talented friends. thanx a lot nageshbhai – you are an inspiration. VASU-KAY-JEEE – aap khudhee ek manjhey huey writer hain mohtarmaa – aur aapney mereliye itnee acchhee alfaz sey nawaazaa hai. bahut shukriyaa. i think i will bee seeing a joint write up very soon – nageshbhai please take note. Santoshbhai, nawathebhai and walijaah sahab – how i wish i could meet you all. the people above are all my friends and now the tribe is growing – milney kee icchhaa jaag uthee hai. Garden City – Bengaluru ( INDIA ) – AAYEEYEGAA ZAROOR – MILBAITHENGEY AUR RAFI SAHAB KEY BAAFREMEIN KHOOB BAATEIN KAREGNGEY AUR UNKEY GAANEY BHEE GAYENGEY. Bhagchandjee – such eloquence can only come from a true rafi bhakt and not just a fan. You say it ended abruptly – I was actually exhausted and warped by the “ rafi aura “. For sailors like me, sentiments run faster than the human himself. A certain sad rafi song – picked for singing, so very warmly falls flat with my vocals – simply because the pathos in it actually drenches me in tears – so where is the song. The same can be applied to my writing of this article – rafi sahib ek aisey mahan aatmaa they kee – aap apney aapmein kho jaogey. Rafi sahib ek aisaa khazaanaa hai – “ akshaipatra “. You have the ability to ‘sail’ through the topic of Rafi wonderfully like a true sailor. Great write-up, except that it ended early and rather abruptly. You should have gone on…. and on. No reader on this forum can ever be bored of Rafi-talk or nor can have enough of it. The more we talk/ read about him, the greater the curiosity. Most times even the repeat of certain anecdotes is as much absorbing as it was when narrated first time. Ever seen/ listened to Shammi Kapoor when he narrates the incident that once he was out of Mumbai when a particular song of his was being recorded by Rafi saab? How he was upset that the song took shape in his absence without his inputs, how he wanted to tell about certain twists and turns, the extra ‘yahoo’ factor to be incorporated in the song. And when he returned to Mumbai and found the song exactly the way he wanted.. without his inputs being given. Such was the great chemistry between Rafi saab and him (and to be more precise Rafi saab had that chemistry with most actors). Shammi Kappor has narrated this incident a couple of times… each time I could see that twinkle in his eyes… with that feeling of nostalgia, of ‘trying to relive those glorious moments’ kind of expression. He is never tired or bored to tell this anecdote again and again, nor are we bored of listening to it again and again. We the Rafi fans feel great, emotional and nostalgic each time Rafi saab is being discussed. de l’oxygène qu’a besoin le corps humain..
Je le dis a haute voix que toute l’ Inde porte préjudice a un incomparable grand homme et chanteur. Ou est le BHARAT RATNA ?. dear rameshji excellent write up on our beloved and greatest of the great rafi saheb. rafi saheb himself was a farishta full of humanity. his massage to the world was love, humanity,kindness and brotherhood and he did this thru his good acts and song sungs by his honey like sweet voice. rafi saheb truely deserve for bharat ratna. I believe one day our so called selection commettee will think seriously about the matter and millions of rafians dream will come true. next week on 31st july’11 we will celebrate (with grief) our beloved rafi saheb’s 31st death anniversary. Long live rafi saheb. What would you do if your sternest warning fails to cut much ice with the reader and he finishes the article in one go? Either you stop issuing warning or the reader overrules you; I think that the latter is a better proposition!!! An excellent articles where the ‘quintessential’ Rameshbhai comes to the fore. The definitions do not appeal to you; the persona of Rafi saahab is too great to be compartmentalized as a definite form. His innate goodness is what had enabled him to negotiate the path that every one else was not even prepared to tread. Lage raho, Rameshbhai, Rafi Saahab ka bas naam type kar deejiye ungliyon se, kuchh na kuchh apne aap likh jaayega. Kyon ki woh dil ki aawaz hogi aur sab ko seedhe sambodhit karegi. Sorry but No Comparison please. Rafi Saheb sung selflessly for the masses (and continues to do so) and also for Jawaans on Borders during war times and when Sachin was approached for such matches for benefits of Jawaans, he refused as he is always busy minting money and creating records for himself and many times failed when he was needed for India’s victory as opposed to Rahul Dravid who stood as rock solid wall for India and has been denied to show his full talents because of the Sachin mania. Sachin is personally known as very arrogant and over commercialized person with likes for all kind of luxuries as opposed to the myth that he is very humble and simple person and can’t be put on same slot of Rafi Saheb. Also cricket has spoiled India more than anything for ruining our performances in all other sports. Also He is competing against 8-10 countries and does not deserve that kind of award. Whatever you say, you say it with a flair that is very appealing.You speak your heart out.Congrats sailor!Happy sailing on Rafi ocean.May you reach the shore successfully. what can i say about any article written by you !!!! it is always straight from the heart and is no holds barred !!! and when it comes to talking about our dear beloved Rafi Saab it has to be a perfectly written “dil se” piece, which is bound to bring both tears and smiles on the readers’ countenance. you have said it absolutely sir, that there will never be another Rafi Saab, and any tribute to him shall just about miss the mark in terms of being all-encompassing. yours comes vrey close to perfection from that point of view. Agree with you totally. Rafi sab’s humility and simplicity indeed are two attractive attributes that we all love him for and yet again you have reflected upon them in your usual exuberant and spontaneous style. Kudos and keep them flowing !!! I am a big fan of Sachin I think he should get Bharat ratna because many who got this award so less than him,he is great player in the history of cricket if we compare sachin ji with other player in cricket world we can say sachin is one of the best and I think mohd rafi should got this award before 30 years or more and today this award is so small for him…..
your musings, your jottings, as you call them, reflect one thing: your love for Rafi sahab. There is a thought, there is a flow and there is a way of taking the reader along with you __ in your writings. it is like you are conversing with the reader. This has more impact than any scholarly article. Keeping it simple, keeping it short and writing straight from the heart__ is the hallmark of your writings. I enjoyed reading this. And rafi sahab is truly a singing god. And his humility ahs no parallel. Sachin tendulkar is a living legend, the honour of Bharat Ratna will increase, if it is given to Sachin Tendulkar. I have heard sachin saying that his favourite singer is Kishore Kumar. Mohammed Rafi saab is the numero uno when it comes to playback singing. Let Rafi saab and sachin tendulkar receive Bharat Ratna together. For praising rafi, others need not be let down please. Sachin an ordinary player – hope sachin has not been understood properly, many occasions the foundation set by him has been responsible for many wins that needs to be noted. The greatest ever batsman born in the world and in the history of cricket – just last week brian lara another cricketing great has said these words about sachin – the records set up by him will be hard to break for a long long time. Rafi sahab was appreciated by the comtemporary singers, that is his real award. This corrupt Govt will sell Bharat ratna award to ordinary players like Sachin, who rarely has been responsible for a win; he always placed him on safe position and made records. Rafi sahab himself is greater than Bharat ratna. Rather a reward should be distributed to others on his name. Great article,Very spontaneous too.And the feelings which u have brought out is shared by many bhakts including me.This corrupt govt which cannot even do a simple thing like hang Kasab .We cannot expect it to confer Bharat Ratna on Rafi saab.Yet again this year we will be remembering the great rafi saab.Till date no one has come even near the level of playback singing of rafi saab.We should also note that he had sung in the era when technical support was not there like today.yet the voice sounds so much powerful,divine,pure. How beautifully have you written this article,,,really hats off to you..An excellent write up . This is really an excellent tribute to more than Excellent personality, the one and only great great RAFI SAHAB…Thanks for sharing your thoughts. None can excelled you in writing inner feelings so sophisticatedly about Rafi Sahab than you, your feelings are true to mirror and your true depictions of the various scattered thoughts will definitely lead others to ponder over it minutely. Again here at the bottom you raised the issue of Bharat Ratna for which i strongly support you and plead others to try for this prestigious award for the son of India who always scattered smiles for others with his melodious songs. Ramesh Kurpad Sahab, you are just great my friend, I always admire you and the devotion you have towards our beloved Rafi Sahab. your write up is not simply the write up but ” inner cry” who could listen it and understand it better than Rafi fans.